Leading the Way: Lockhart leads the BMC Summer Institute and Festival, which draws more than 400 students from around the world, professional musicians, and more than 40,000 concertgoers. Right Direction: Brevard Music Center Artistic Director Keith Lockhart has conducted nearly every major orchestra in North America. Then ... Lockhart (far left in both photos) studied at BMC’s Summer Institute during 1974 and ’75. ... And Now: Lockhart leads the program as artistic director. The Apprentice: Students attending the Summer Institute study under professionals such as cellist Yo-Yo Ma, who taught a master class and performed as the guest artist in 2011. 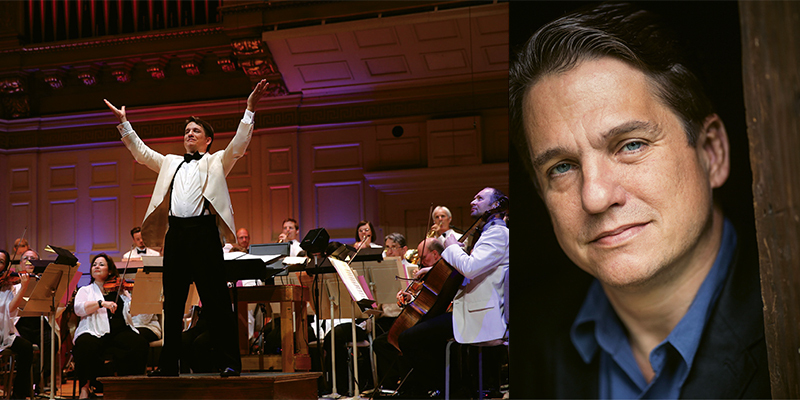 In the Spotlight: When he isn’t spending summers in Brevard, Lockhart conducts the Boston Pops Orchestra (shown) and is principal conductor of the BBC Concert Orchestra. Natural Wonder: BMC’s 180-acre wooded campus offers an inspiring setting for students like harpist Anna Weigandt. For the Love of Music: At BMC, Lockhart takes a broad approach to music education. The goal isn’t just to train classical musicians, but to create arts patrons along the way. Conductor Keith Lockhart strides across the stage at Brevard Music Center on a balmy summer evening. All eyes are on him as he steps onto the podium and raises his baton, commanding oboists to purse their lips in preparation and violinists to hover their bows above the strings. With a flick of his wrist, the orchestra springs into action. Lockhart crafts this magical moment of anticipation around the world. Queen Elizabeth II witnessed it during her Diamond Jubilee at Buckingham Palace when Lockhart led the BBC Concert Orchestra as principal conductor, a position he still holds. During his illustrative career, Lockhart has conducted the Deutsches Symphonie Orchester Berlin, the NHK Symphony in Tokyo, and the Melbourne Symphony Orchestra in Australia, just to name a few. And he’s been conductor for the Boston Pops Orchestra since 1995. Yet, each summer he returns to Brevard to conduct promising young musicians; this season marks his 10th anniversary as artistic director of Brevard Music Center Summer Institute and Festival, taking place throughout July and August. Over 400 high school and college students attend this internationally known summer training program each year. Students travel from as far away as South America and Singapore to study classical works usually reserved for major orchestras and opera companies, and have the opportunity to share the stage with world-renowned soloists including Yo-Yo Ma, Itzhak Perlman, and Joshua Bell. The students perform the same iconic melodies from Beethoven’s Symphony No. 5 and Verdi’s “Requiem” as professional musicians have for centuries, delighting over 40,000 audience members each summer. Why does Lockhart pause his work as conductor of the Boston Pops and BBC Concert Orchestra to spend his summers in the mountains of WNC? Beyond his desire to share his knowledge with the next generation of musicians, he thinks of Brevard as his homeland, a place to return to his roots. Lockhart spent his childhood summers in Brevard with his maternal grandparents beginning in the late 1960s. His grandfather taught math and physics, and sang in his church choir, and both grandparents played piano. His parents moved to Brevard in 1985, and his mother still lives there. Although Lockhart was born in Poughkeepsie, New York, he considers Brevard his familial home. He remembers going to summer concerts at Brevard Music Center with his grandparents when he was a boy, and the joy of absorbing the sights and sounds of the orchestra. He studied piano and clarinet, and became more serious about music during his high school years. His strongest memories of Brevard were shaped during the summers of 1974 and ’75, when he was a student at the Summer Institute. He spent hours in practice rooms and rehearsal spaces nestled in the wooded campus, which he remembers as being especially rustic at the time. The sprawling grounds, now 180 acres with a large pond surrounded by pine trees, combined the atmosphere of an old-fashioned summer camp with the rigors of a music conservatory. He remembers experiencing the power of Shostakovich’s Symphony No. 5 for the first time at BMC that summer. The Soviet-era Russian composer had passed away that same weekend, and Lockhart never forgot the “particular poignancy” of hearing one of the composer’s most notable and challenging pieces that day. Lockhart exposed a new generation of musicians to this stirring work on June 26, 2016, when he conducted the piece at BMC. A full orchestra of college students performed it for an enthusiastic audience who leapt to their feet for a standing ovation as the timpani’s final, booming notes echoed across the auditorium. Hearing that piece as a student at BMC and studying many other major works fueled Lockhart’s desire to become a conductor. He attended Furman University in Greenville, South Carolina, where he majored in piano and German. He went on to earn his master’s degree in orchestral conducting at Carnegie Mellon in Pittsburgh, Pennsylvania, before becoming associate conductor of the Cincinnati Symphony and Cincinnati Pops orchestras. Since then, he has conducted nearly every major symphonic orchestra in North America, including the New York Philharmonic, Cleveland Orchestra, and Philadelphia Orchestra. This path has allowed him to travel the world with some of the finest professional musicians in the industry. It’s a global perspective that he can share with BMC students each summer, though he’s quick to point out that music is a never-ending journey for even the most experienced conductors. “It’s a constant challenge to refine your understanding of composers’ intentions and refine your ability to communicate them to other people,” he says. Brevard Music Center serves as a launching pad for young musicians who want to follow in Lockhart’s footsteps, yet preparing students for careers in classical music isn’t his only goal. In fact, he hopes that many of his students go on to professions outside of music to become doctors, lawyers, businesspeople, or scientists, and most importantly, lifelong patrons of the arts. This approach marks a shift for summer institutes like BMC that were once singularly focused on professional training. Lockhart sees this broader approach to music education as the future of Brevard Music Center. “What we’re training people for, in some ways, is a lifelong relationship with music—a true, deep love of music that’s born out of understanding it at a pretty high level,” he says. For students who do pursue classical music professionally, Lockhart says the field is significantly more competitive than it was 50 years ago. He aims to foster versatile musicians who can craft careers outside of a permanent post in a symphony orchestra. Those jobs are fewer and farther between, and he urges his students to think beyond the paycheck. He believes that having a career outside of music and continuing to perform in a community orchestra or choral group is an equally worthy goal. As the final notes of Shostakovich’s symphony reverberate into the pine trees, Lockhart’s dream of fostering future musicians is made real. It’s happening on stage as the student soloists stand for applause, but also on the lawn of the amphitheater where families listen with rapt attention. The children in the audience may become musicians themselves, or they might not. As long as they continue to be inspired by and support classical music, the future of Brevard Music Center is as bright as the stars above. Music and nature intertwine at Brevard Music Center Summer Institute and Festival. Hundreds of students from around the world gather at the picturesque lakeside setting to study and perform some of the greatest works in the classical music canon. The public is invited to attend more than 80 performances, ranging from intimate chamber music to fully-staged operas. Performances run through August 18 at Brevard Music Center, 349 Andante Lane, Brevard. For tickets and scheduling, call (828) 862-2105 or visit https://www.brevardmusic.org/.